Take your training from amateur to professional. Callum Skinner knows how to get into winning form – what with two Olympic medals and a gold in a UCI Track Cycling World Cup to his name in 2016 alone. And luckily for you we had a chance to sit down with Callum and get his best training tips for all you eager cyclists to help you raise your game. Rushing, stressing and cutting training sessions short due to poor planning obviously isn't ideal. This one seems simple but it can be easily overlooked if you have a busy lifestyle. Plan at least one week in advance and take on a manageable work load. Rest can be just as important as training. If you’ve planned a day off or an easy one hour coffee ride stick to it. Equipment is not the only place you should put your money. Consider sports massage, coaching and professional bike fitting. You’ll probably get more bang for your buck than saving a few grams on your equipment. Cycling is one of the most measurable sports out there and as a result it’s easy to get lost. If you are getting bogged down or disheartened by bad numbers, lock up the stopwatch or turn off the Garmin for a week. Keep balance in your life, getting better at cycling doesn’t mean you can't have a night out. It’s important to switch off and relax with people outside of sport. That way it'll feel less like work and help keep the passion. Even if you are a lone wolf sometimes it’s nice to train in a group. You can push each other on and share ideas – you'll only improve your fitness and skills! If you find yourself stagnating try coming up with some new ideas; the same training will equal the same result. Even if you are progressing it’s nice to keep training fresh and evolve what works for you so don’t become complacent. All you can control is yourself and what you do. Compare your time or performance to what you managed previously not how it compares to others. I’m writing this on our rest day in the Olympic Village. With one more race day to go. What a games its been so far! Our first event was the Team Sprint where winning Gold was the biggest achievement of my career. It was special for so many reasons. Chiefly because of the amount of work I've put into this one event. For the past two to three years its been my primary focus. Changing my mind set to just focus on this event was hard. I'd previously found most success in other events like the Sprint and Kilo. Having the conviction to continue with this sole focus was also a struggle at times. Its fair to say over the last few years I have been dropped at around half of the events we entered. Every time it didn't get any easier to deal with the disappointment. I was so frustrated with myself. I felt as if I were letting the team down again and again. Sometimes it was clear that we had the best Man 1 and the best Man 2 in the world and often we lost time due to my lack of pace. It was hard but after every set back I had to dust myself down and try and improve for next time. It was made easier by the fantastic team I'm surrounded by. Jason and Phil were very supportive over the last few years through wins and the losses. We all believed if we could have a clean ride we could be world beaters. Its also great to have athletes such as Phil and Jason to chase in training, they set the pace, I had to match it. Thats what made the night we won the team sprint so special. Personally, I got on, did a great lap, three times in a row. And as a team we've never known such pace or consistency. It was also special due to the means we achieved this win, with the help of the support staff and coaches. We had to get creative with my gym and on the bike training. For example I don't train like a traditional sprinter in the gym, I don't do Squats due to injury issues with my back. For a Sprinter trying to improve my start this can be a real puzzle to overcome. I’m so grateful for the physical condition the coaches and support staff helped me achieve. I truly believe we have some of the most talented coaches, physiologists, physiotherapists, bio mechanists, performance analysts and nutritionists in the world. Its not only a team sprint in terms of the three guys on the track, there is a talented team back in Manchester who make it possible. Finally I’ll always remember the way we won that gold medal. In the first ride we broke the Olympic Record and qualified first, a fantastic start. In the semi final we went a little slower and New Zealand went a little quicker beating the Olympic Record we had just set! In the final we knew we had to leave it all on the track. New Zealand on the home straight, seeded first, us on the back straight seeded second. We won by a whisker, one tenth of a second and improved our time to once again break the Olympic Record for the second time in the evening. Also to have won against a team as strong and consistent as the Kiwis was immense. To be olympic champions, having broken the olympic record twice and to have beaten the current world campions. To my mind there in no better way to win. Hi everyone, its finally official. I’m off to the Rio de Janeiro Olympic Games! 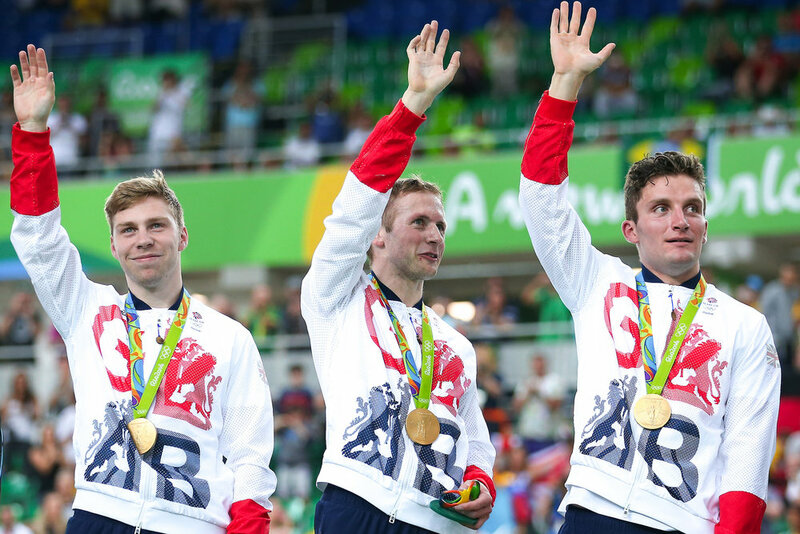 Ive been selected along side current Olympic Champions Jason Kenny and Philip Hindes. It certainly wasn't an easy team to break into! I’ve known for a few days now and it great to be able to share this news with you. As you know it hasn't been easy to get to this point. There have been ups and downs but overall we have been building our momentum towards these games. I truly believe the best it yet to come. Only the Team Sprint has been finalised so far, as it stands I’ll be riding in Chris Hoy’s old position in man 3. I’m also confident of gaining selection in the individual events. Overall I hope to be competing and medal competitive in three events! I also managed to get to the minor final of the individual sprint where i managed to pick up 6th place. You can see that final race bellow. I thought I’d update you all on how the last World Cup went in New Zealand. Our goal for this World Cup season is to qualify the the GB team for the Olympics. Opposed to previous years this means we often ‘train through’ World Cups as much as possible. This is so as we can ‘taper’ our training down in the run up to the Olympics so we perform optimally when it matters most. With this in mind we had a relatively successful trip. In the Team Sprint where I was the third rider we finished in fourth place. The best finish GB has managed since last season. Not a spectacular result but enough to maintain our position in the qualification table to sure up our spot at Rio. However as a team we are always striving to do better. Hi everyone, things have really taken a turn for the better since my last blog. I’m happy to announce that I have been selected to ride the 2nd World Cup in New Zealand. This is great news as it puts my qualification path for the World Championships back on track. This is because in order to compete at the World Championships a rider has to compete in at least two World Cups. New Zealand is World Cup two of three so having missed the first one gaining selection for New Zealand was vital. The specific events are yet to be confirmed but its likely I will be in the Team Sprint and the Individual Sprint. My selection represents a bit of a tun around in fortunes. Since my last blog I have been fit and healthy and I’ve been able to get some really good training in. With hindsight it was the right decision to pull out of the British Championships and the Europeans, I feel like I’m in a far better place pre New Zealand than I was before the British Championships. Its also an exciting time to be making the move back into the team. Numbers in training are starting to show I’ve made really good progress in my Team Sprint ability.